The seeds for The Bird Sculpture Sanctuary of Walnut Springs Park were sown years ago. In the1920s, Robert Hugman, who would design the San Antonio River Walk, approached the city with plans for the park and it was completed in1941. Then the park fell into disrepair. In 2006, the citizens approved a bond issue and the park was officially reopened in 2011. 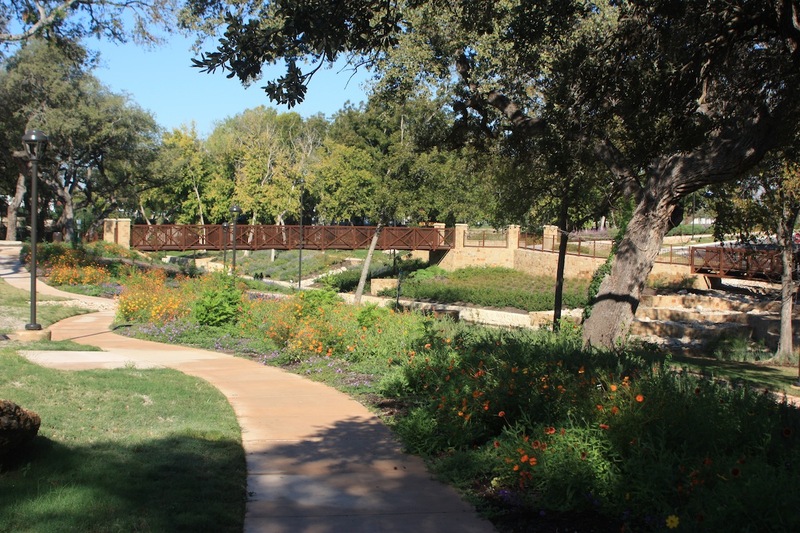 The recently rejuvenated park in the heart of the city won two prestigious awards: The Texas Recreation and Parks Society Lone Star Legacy Park designation and the Texas Downtown Association President’s Award for Best Public Improvement. The other part of the story begins in the not so distant past with a Seguin Garden Club project tasked with making Seguin a bird sanctuary city. Although, the city received the designation, little was done with the idea. There are two signs announcing the bird sanctuary city as you enter the city from the east. One is on US Highway 90 and the other on US Highway Alternate 90. 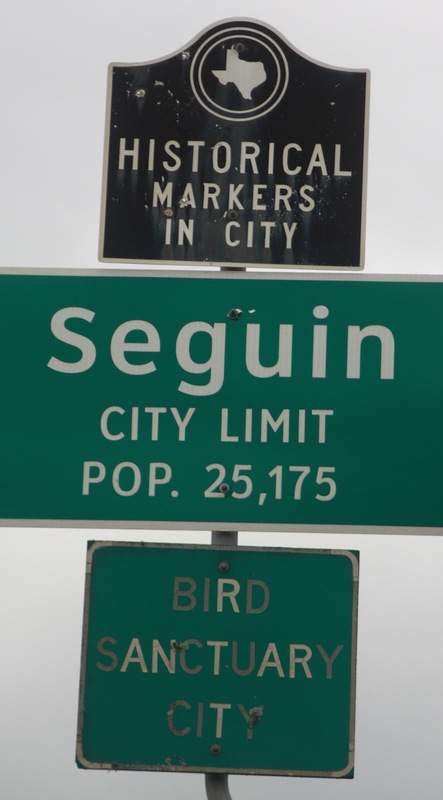 After moving to Seguin in 2005 and seeing these signs, sculptor Marika Bordes kept this knowledge in the back of her mind. When Marika and a fellow member of the Seguin Oakwood Art League (SOAL) discussed the need of more visibility for SOAL they realized an excellent way was to enter the annual Holiday Stroll Parade. The concept of a bird sanctuary city gave flight to her imagination and she suggested creating bird costumes. 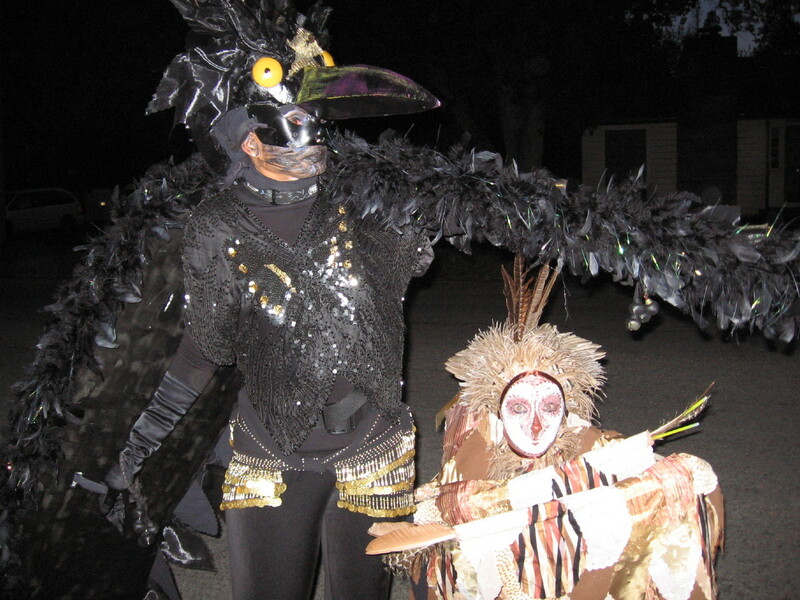 SOAL went on to win awards in this and other parades using the “birds” concept. The birds stayed with Marika. After many walks through Walnut Springs Park, a bird sculpture sanctuary took form. Conferring with her students, volunteers and community members, the decision was made to approach the city. The team soon realized that besides creating sculptures and receiving approvals, the project would require raising funds. By the time, Marika and her team presented the project to the city council, the Department of Parks and Recreation recommended approval of the project and the Seguin Chamber of Commerce awarded a Help Seguin Shine grant. The City Council, not only unanimously approved the project but to the surprise of some, provided funding. The work began to sculpt eight birds and raise the additional funds. 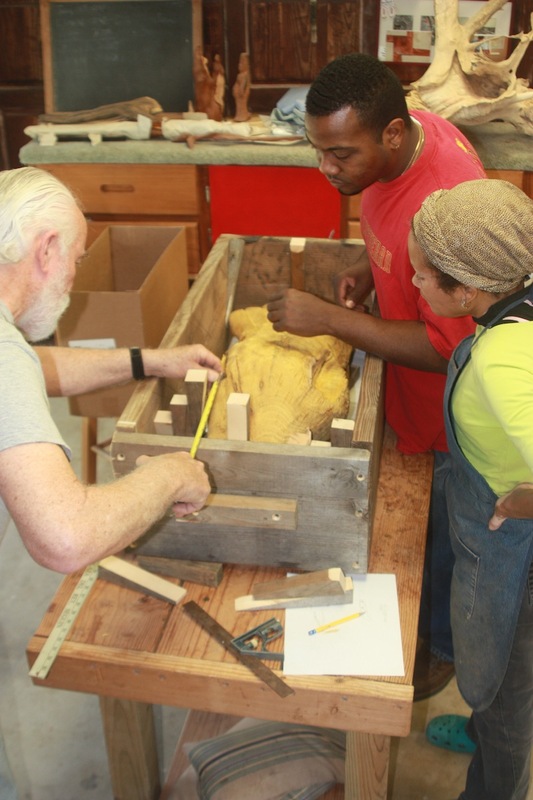 Marika and three students, Barry Duncan, Howard Crunk, and Jimmy Schmidt, set out to design and make the sculptures in wood, metal or a combination of the two materials. They selected birds native to the area: the hawk, roadrunner, heron, owl, and scissor-tailed flycatcher. 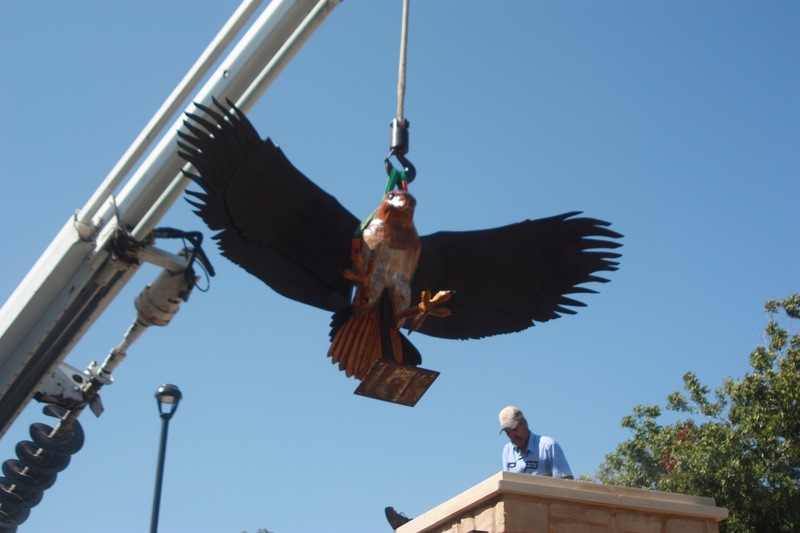 This was a team effort and was most especially seen in the making of the primary sculpture for the park, the hawk. The body of the hawk is made of bois d’arc* and the wings of metal. The team had to develop an internal mechanism to prevent the movement of the wings from damaging the wood during high winds and to secure it to the entrance column to the park so that literally, it would not fly away in a storm. Many hours were spent just in the designing and engineering of this sculpture. Fundraising events and in-kind contributions were key. Volunteers came to the rescue to raise additional funds during a key fundraiser, “Art for the Park” held during Seguin’s annual ArtsFest. 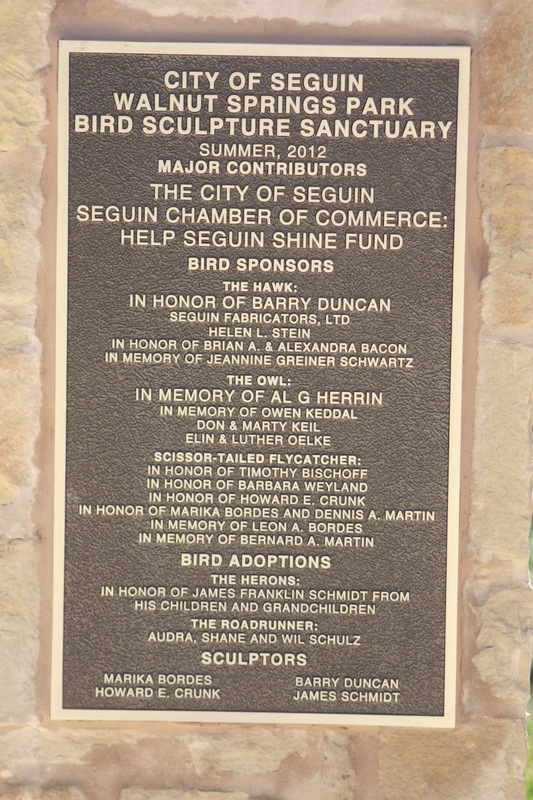 The fundraiser offered donation levels, such as, a poster signed by the sculptors, placement on the donor plaque, and “adoption” of a bird or a family of birds. Most of the food, beverages, and entertainment were donated. There were also proceeds from the silent and live auctions of art. A local steel fabricator donated materials and technical knowledge and the city installed the sculptures. The artists and associates set out on a mission to create a masterpiece for a public space in Seguin. Their vision was a cultural landmark and an economic engine for the city, businesses, and the community. They wanted to give the community the first major work of public art done by local artists. 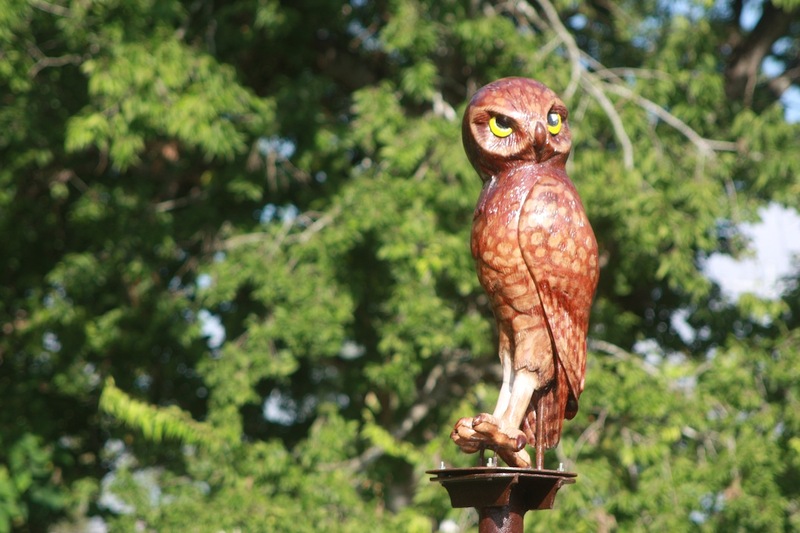 They envisioned a bird sculpture sanctuary that would enhance visitor appreciation of the park and its flora and fauna. Their art would add a dimension of beauty that would be another incentive for people to visit and enjoy Walnut Springs Park and Seguin. They also saw that by strengthening Seguin as a bird sanctuary city, those interested in birds and public art more people would visit the the park. Also, the birds would be an attraction for children and add to their education and appreciation for wildlife. The sculpture sanctuary came into being because of the vision people had for the city nearly a century ago, the dedication and support of a community, and the tenacity and dreams of the artists. As marika said “We had to believe in the results. Faith is to believe in what one does not see. Yet the artist sees what she believes is there. 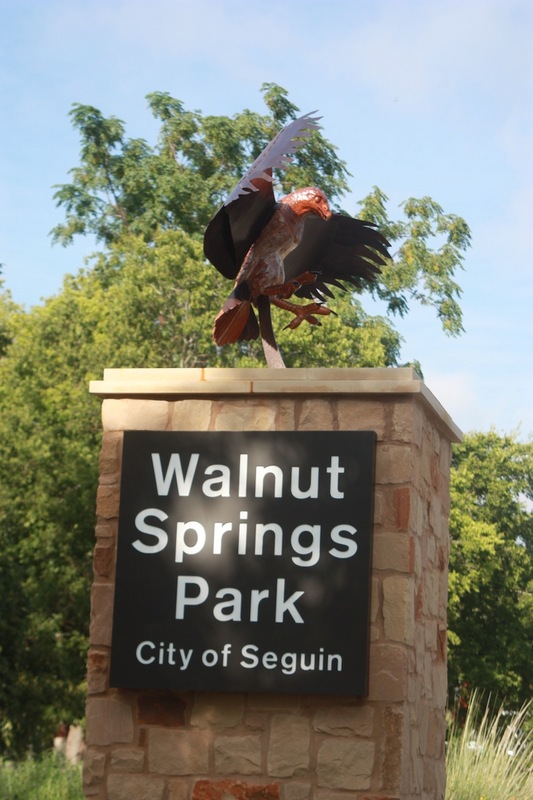 The dedication of the Seguin Walnut Springs Park Bird Sculpture Sanctuary was on September 18, 2012. Other names for bois d’arc include osage orange and horse apple. This entry was posted in Art for the Park, Bird Sculpture Sanctuary, Commission, Public Art and tagged bird sanctuary, City of Seguin, lone star legacy, marika, marika bordes, metal sculptures, Sculpture, sculpture wood, Seguin Art, texas recreation and parks society, Texas Society of Sculptors, The Arts and Community, TSOS, Walnut Springs Park. Bookmark the permalink.